Anne-Marie…you never cease to amaze me! So sorry you won’t be able to attend. If you “PAWS FOR A CLAWS” you may make my dream come true! All my life I’ve supported animals in need & now am working on a way to support them even more…”PAWS FOR A CLAWS” Handcrafted Soaps! ‘Wash Away Pet Homelessness’…ALL Profits Benefit The Animals! Attending the conference would help me tremendously in so many avenues. I have learned so much from your inspirational websites & book that I can’t thank you enough for it all! You have made me into The Mad “Soaping” Scientist creating soap recipes & experimenting with so many different combinations of ingredients. I know I would gain an incredible amount of knowledge from the conference not to mention the wonderful memories! The Animals & I thank you for the chance of this unbelievable opportunity! Wow, that’s a lot of moving! You’re right, it sounds like soaping would be a great option for you :). Thanks so much for applying! Hello Anne-Marie and all the wonderful staff at Brambleberry! This blog has been such a great inspiration! I’ve been following it for the last several years and it really is the main reason I got into soap making! The wonderful videos and how-to’s provided me with a lot of knowledge and assistance. It really gave me the confidence to go into business and start selling my soaps, scrubs, polish and butters. Soapqueen.com has helped me build a solid foundation for learning how to soap and it has helped me realize my true calling and passion. I would love the opportunity to attend the conference because it would give me the opportunity to expand my knowledge of soap making even further and get the chance to meet amazing people in the industry. The conference looks amazing and I would so love to go!! Thank you! I’m so glad you have found inspiration and information here! That all makes us so happy when we hear that :). Thanks so much for applying! Anne-Marie is never ending! I would love to go and have the opportunity to meet all those in the industry & learn from them face to face! I’ve been doing soaping for years now, but something is stopping me from going into business. I’m ready now to move with it, if only I knew what it is. Maybe is fear of success and handing the money/taxes side of it. I know one of my long term goal is to have a small warehouse of my own with a small staff producing soap all by hand to sell in stores, etc. Somehow.. I need that positive push by someone who know it can be done..
By attending that conference will give me that opportunity to push forward with confident! Thanks Anne-Marie for giving one lucky soap maker the opportunity of a lifetime! Thank you Anne-Marie for your generosity. I would be honored to take your place. I am a customer of Brambleberry, an experienced soaper, and would like to attend the conference. However, if I go in your place, I want to, at least in part, work the conference. This means promoting Brambleberry, assisting new soapers with education and safety precautions and assisting the Brambleberry crew. Thanks so much for applying! We will be announcing the winner soon! To be able to attend this conference would be SO SO COOL!!!! I was unable to attend Central Soaper’s Workshop this year due to scheduling conflicts and it’s right in my back yard practically..was very disappointed! I’m ready to step my hobby/business up a notch! What a great opportunity to learn from the pros! Thank you so much Anne for awarding this opportunity to a lucky soaper! To go to this conference would be a dream come true. Each year I read about it and only wish I could be there. I’m no different or no more deserving than any one else but if I’m choosen I will absorb as much as possible. Good luck to everyone. Oh yea as my 3 yr old granddaughter would say “cause I do”. I would so love to go to this conference! I love making soap and I even remember when I was about 10 talking to the pharmacist about making my own lotion! He sugested that I use a base and just add stuff to it. Anyway, it would be well put to use if I won it. I started my business with the intention on creating an income that allowed me to pay for my disabled son’s therapies. I attended the beginners CP soap class at Otion in Bellingham, Wa and I fell in love with soapmaking. I really want to take my business and passion to a new level. I am very excited to attend and meet and learn from all the women, mothers, that have combined their crafty passion with excellent business strategy to create the live they dream of for them and their family! That’s so awesome that you have visited Otion before, I love being able to connect with local soapers on this blog 🙂 Thanks so much for applying! What a wonderful opportunity. While many-a-non-soaper may opt for a trip to Disney or Hawaii, attending the Soap Convention is like putting a kid in a candy store. . . more like putting a kid in Willy Wonka’s very own Chocolate Factory. While I may not find any wallpaper to lick or be swimming in any chocolate rivers, I’m sure there will be excitement at every twist and turn. I have visions of vibrant colors, fragrant scentsations, and soapthetically pleasing creations. I’m not going to be a Veruca Salt and go on about why I think I deserve the Golden Ticket. We all deserve it. One of the things I love about soaping is the support and encouragement we give each other. I’m not going to lie though, I wouldn’t mind that trip to Hawaii either. I totally agree…a trip to the Soaping Convention is the soapers equivalent to Hawaii! 🙂 Thanks so much for applying! I would love the opportunity to really jumpstart my abilities and expand my knowledge is the soap arena. I was laid off a year ago and have not been able to find a “real job” I was a counselor at a university for 11.5 years and suffered “workforce reduction” I have been trying to re-invent myself and soap is the way I’m trying to do it. I live in AZ so at least I could get there fairly easy :O) It would mean the world to me, and really give me the boost I need to help turn my dream of owning my own business, and doing what I LOVE to do– create beautiful things that will help others, and contribute to this world that we live in. Thanks so much for applying! I’m happy to hear that you have been so inspired by soaping. We will be announcing the winner soon! I would LOVE to attend and blog for you at the conference this year. I live in So Cal where I am a working actress and stand up comic, who happens to make soap, quilts and upcycle things into reloveables. Life can be crazy in my line of work so I keep grounded with busy hands. I soap for sanity craft for calm 🙂 it centers and grounds me. I’m a corporate comic and I’ve worked worldwide including tours to entertain the troops stationed in The Middle East and Africa. I bring The Funny and Fun! Thanks so much Anne-Marie for your generous offer to give away a ticket! You are a key reason why soap making has become so popular. You definitely inspired our nascent company! We are just starting Dirty Momma Soap and Dirty Baby Soap and are just about to try to go a little bigger. Right now we are known to the circus arts schools in LA , in the Handspinning community and our local community, but we want to grow a little bigger and have never been to the conference and need to attend. Please throw our hat into the ring! Soapmaking has become my passion over the past six months! Being diagnosed with cancer almost two years ago made me question if I have made a worthwhile contribution in this world…have I made any difference. I have a wonderful family and a decent job. But I felt that I was missing something until I attended a presentation on the possible detrimental effects of ingredients used in everyday personal products and cleaning supplies. I have since made natural soaps that have not only felt good on my skin but feel good to my soul. I have a new mission in this wonderful life after cancer; to create skin-friendly soaps for my family, friends and neighbors by running a soapmaking business using natural oils and botanicals. 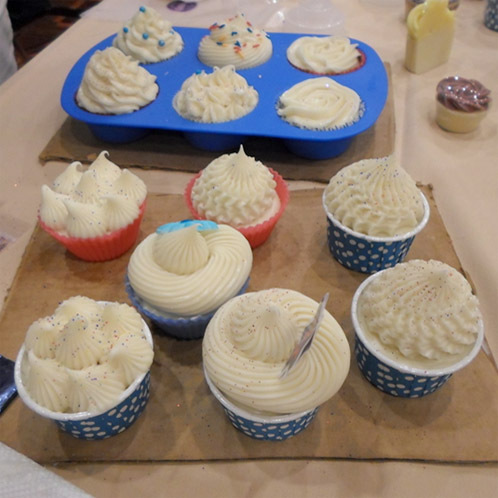 Attending the Conference would be a dream come true where I could learn from other experienced soapmakers and experts, network and make a difference. That is a beautiful mission, and I wish you good luck and success 🙂 Thank you for sharing your story with us! All I can say is that attending this conference is on my bucket list along with seeing Paul McCartney! I saw Sir Paul. Now all I need is to go to this conference. I was planning on going but medical bills got in the way. Finding the art of soap making literally saved my life. I was bed ridden for years waking up to pain day in and day out. While the pain is still there I have been able to on most days get up and make some soap. I have a purpose each day. The thing about not being able to move or get out of bed is that it gives you a lot of time to read and watch video’s about soap making. I have met many wonderful people on this journey and would love to see them at the conference. I love to learn. It is my life passion. The science of soap gives me artistic, educational and tactile rewards in each batch. I live in AZ so it is relatively easy to get there and I am excited to be given the opportunity to even be considered to have the chance to attend. I won’t have the chance to go to any other conference. This is the last chance. I hope to be able to go. Thank you. Thanks so much for applying :). I’m so glad that you have found a way to turn an outlet into a hobby/business that you love! I am saddened to hear your story, but I’m glad you found soaping as a healthy outlet! Thank you for sharing your story. I started making soap in September 2011, a few months after my mom had passed away. Mom always wanted to have a shop of her own. I went to craft show that September and bought a bar of soap. As I walked around the show I held that soap up and kept saying I’m going to make this. I went home and researched it and started making my own soap. I have opened an online shop and dream of having a brick & Mortar store. I would love to go to the conference because I feel it would be a great learning experience that would help me with my dream of having my own shop. I have a dream of owning my own health and beauty business and I have been putting in 100% effort to make this happen for the last year and a half. I am allergic to just about any skin product that I buy at the store, so I make my own soap and other products, and would like to provide these to other people with life-long skin issues like mine. I am a beginner soaper and I have never met another soaper in person. I would LOVE the opportunity to connect with people with similar dreams. It would provide me with so much inspiration and new ideas, and would help me make my dream come true. I’m so sorry to hear that you won’t be able to attend, but I think it’s really neat you are putting this out there to give someone else the opportunity to go! I would be so overwhelmingly excited to meet all these folks that I’ve been talking to and learning from online for years, and really honored to get the opportunity to learn all aspects of the business from the best in the industry. Thank you so much! I would love to go to this conference! I’ve just opened my own brick and mortar shop and I’m looking for as much advice as I can glean from experienced people to make sure this shop is a success. My soap studio is in the back of my shop (as well as my fiber/dye studio), and I both sell the finished soap/lotion/lip balm/soy candles and teach others the basics of soap making. Congrats on opening a brick and mortar store — that is truly an accomplishment to be proud of! I’m glad t hear your spreading the joys of soapmaking to others too. Thanks for your entry! Hi! First off, this is so awesome that you are giving away a ticket to the conference, but not so awesome that you will not be able to attend. I have been making cp soap just as a hobbyist for 3 1/2 years now. I used to buy handmade soap from a woman at a local craft fair and she stopped selling a while back. Some time later I had the opportunity to help out at a non-profit folk school that opened in my town to teach traditional crafts. One of the classes I assisted with was hand crafted soap and I was hooked! I was an art major turned medical lab technologist in college so soaping seemed the perfect craft for me, true alchemy, a blend of art and science. I couldn’t wait till try it myself. I started scouring the internet for any info I could find and that, Anne-Marie, is where you come in! I found all your wonderful videos and tutorials and you make everything look so beautiful and easy that I was even more inspired. I found out some time later that the local woman I used to buy soap from is none other than Leah, the executive director of the HSCG and that their headquarters was practically right down the road…small world. I currently only make soap for friends and family and think my soaps have come a long way as I am constantly looking at and reading about new soap techniques and ideas. I still struggle with some stuff (milk soaping, glycerin rivers, soda ash, some swirling techniques) that I would like to overcome before I delve into being an official business. I would LOVE to be able to attend the conference as is seems like such a great venue to ask these questions and maybe see what I can do to hone my skills AND gain more confidence. Thanks so much for this opportunity, and for being one of the one of my main soaping role models. Your enthusiasm is truly contagious!!! There are some great stories among these comments so good luck to all of us and I hope someday to meet many of you. Our home: three teenage boys, a husband, two hunting dogs. I work full time in law enforcement arena, the only time I get to have pretty things that smell good is when I’m soaping. I am trying to start a soap business and this would be a phenomenal opportunity for learning, plus I could actually have a girls weekend which I’ve never had, lol. I’m surrounded by testosterone everyday, a weekend for learning, pretty things that smell good sounds like heaven!!!! Good luck to everyone and who ever wins may they have the time of their lives! I would love to go. I lost my job in 2005 and every since then, I have been unemployed and wanted and needed to find something that would not only help me stay sane but help out my family. I needed a hobby. About four years ago, I started to research how I would be able to help my family, save money at the same time and love what I was doing. I was a fulltime student and with four children there were at least 1-2 birthday parties a week, I surely could not afford gifts and didn’t want to keep telling my daughters and my son that he could not attend. I happened into a craft store and saw they had a soap making kit on clearance and thought I would give it a try. Of course it was melt and pour but it was well worth the investment. My husband was very cautious of course because I could not take money that we would need from our household to fund a hobby. After doing a lot of research and finding Soap Queen, I waited for the next time I could purchase another kit. I starting giving as gifts and using at home. Someone offered to purchase gift baskets from me and that worked out pretty good until they decided not too anymore. Being a fulltime student at the time, using student loan money, I made my first purchase from Brambleberry and with more research and found a cold process soap making class. With student loan money attended it and thought it was the greatest thing in the world. There I found out there was a convention and I needed insurance etc. Looking at the cost of a membership and how much it was for the convention, I knew, without having a job, a family of 6 living off one income, that would be impossible since I knew student loan money didn’t last forever. I opened an Etsy store in November 2012 as Rhonda’s Soap and Stuff. Making soap brought me peace and I was in my own little world. I absolutely loved it and in August of 2013, everything started to fall into place. I did a couple craft fairs, learned from my mistakes. (Purchased “Craft Show Genius”, thanks Janine and Anne-Marie, I really needed that book) and was finally able to help my family out and we didn’t have to go through an agency to get help. Then the etsy bill rolled around the end of September and my once thriving store, was shut down. I had to start over months later losing customers and money that helped out my family. Attending the Convention would be so wonderful for me, there is so much to learn, I have so many questions, it would be a dream come true really. I applaud your gumption and stick-to-it-tiveness. You wouldn’t believe how common that story is. As the ‘traditional economy’ has failed more and more Americans, many people are looking for a side income or a full time income to supplement wages or job prospects. I am so glad that there is a viable source of business opportunity out there for so many individuals like yourself. Best of luck with your business, and leading your family during uncertain economic times. If you’re looking for a great book, I love the book ‘The Success Principles’ by Jack Canfield. I found it inspiring the first time I read it and revolutionary the fifth time I read it. The exercises are so useful for figuring out your path in life, and in business. Mathair Earth is a Mother and 2 Daughters business. Our goals are being reached in baby steps and at this point education as well as mingling and learning from other successful soap makers would be a huge opportunity. The only problem would be WHO would get to attend! Thanks for giving someone this ‘gift’ of business Anne-Marie! I would appreciate the opportunity because it would be a new experience. I normally attend medical seminars but have never been to one that involves my passion for soap making. I truly believe soapmaking is an art and is such a wonderful way to express ourself. I dream about soap when I am going over an idea in my head. I would love the opportunity to learn new techniques, ideas, and educational inspiration from other artists. At times I feel I have writers block, known by me as soap makers block and some new ideas would help me through that feeling. I truly would love the opportunity to have this experience. I was planning to go but could not fit the ticket price into our budget. Thanks for the donation of your ticket and kind consideration for the prize. And another vote here for dreaming of soaping – me too! What a generous offer Anne-Marie! My daughter (13)and I have been enchanted with soaping ever since discovering your websites about a year ago. We were so excited to learn that you live a short distance (relative) to where we live in Victoria BC, so we took a couple classes at Otion, stocked up on those hard to find in BC supplies and have been hooked ever since We would love the opportunity to go to the soap conference. Thank you again for your offer and continued inspiration and generosity with all the information your websites give us. Oh I am so glad to read that you have gotten to go to Otion. I love the hands on nature of that little store =) Thank you for being a customer. Oh I am so glad to read that you have gotten to go to Otion. I love the hands on nature of that little store =) Thank you so much for your business! I would really enjoy attending this conference in celebration of my 10 years of soaping and growing my soap business! Bramble Berry was one of my first suppliers and I even remember purchasing the “surprise” bags of unusual soaping and candle gear that was offered way back then! Send me and you will have your ticket enjoyed by a seasoned soap vet intent on staying in the game, and enhancing my skills on all levels, so I can continue to enjoy this crazy madness called soaping! Thanks for considering me! The conference is great for experienced soapers and newbies alike. I’ve been an artist in one type of genre or another my entire life. Several years ago, I was diagnosed with a rare, chronic auto-immune disease with a variety of symptoms that has curtailed my ability to do many of my previous creative endeavors. Feeling the need to find a creative outlet and an additional source of income, I stumbled upon soaping about a year and a half ago and…I WAS HOOKED! The best part is, I am able to soap without any limitations because of my illness. I spent a little over a year researching, reading everything I could get my hands on, watching every Soap Queen video that existed (along with many others) and experimenting…boy did I experiment. Soooo…I am now ready to start my own business. To have an opportunity to learn the ropes from some of the best and brightest in the industry, who’ve already “been there, done that” would be amazing! And since I’ve already lined up my first wholesale account, Whole Foods Market (and I am working on a couple of others) being able to attend the HCSC would help get me off on the right foot. Thanks for such an awesome opportunity. I’m so glad that you have found soaping! When you are an artistic person, it’s so important to have an outlet. That’s so exciting that you are going to be starting a business. Thanks for entering! I would love to be able to attend this years conference. I gave the money I had saved for the conference to one of my six daughters that will be getting married in May. I wasn’t able to save up enough before the conference sold out. I learned so much at last years conference! I am a fairly new soaper and feel the conference would be super beneficial to growing by hobby into a real business. I am to the stage in my life where it is time to think about how I am going to support myself during “retirement”. What better way than by doing something I love? Wow, So many of us want this..and deserve it. Even without it we will still love this craft and keep on learning..just at a slower pace. lol My story is no different, I want this bad. It could make a huge difference to what I’m trying to do this year. All I can do is promise to pay it forward if I am lucky enough to be blessed with this. And I will, in some significant way, to another aspiring maker. Thanks! I have been soaping almost 2 years, just joined HSCG this month and am anxious to get certified and learn even more soapy knowledge! Sorry You can’t be there! I’ve been soaping for 14 years but this past year I had the opportunity to do a temporary ‘Pop Up’ shop for 2 months. Never would I have believed the popularity of my products! My husband, customers and family have convinced me to open my own shop. Working on doing that right now! I’m new to HCSG and would love to attend the conference because while I’ve been doing M&P for a long time, I just ventured into Hot Process and know I have a lot to learn! Every last penny I have is going towards opening a store, I would love to win a ticket to advance my skills as a soap maker! I would like to win cause making soap is awesome! But getting together with other soap makers in such a grand setting is super awesome! I love the HCSG conferences! I have attended past conferences in Tucson, St. Louis and Raleigh. I have seen the group grow, and watched the changes in the field of soapmaking. I see new faces, new techniques, and a new emphasis on beautiful, colorful, artful, and sculptural soaps, maintaining the goal of creating nurturing proucts to pamper the skin. The speakers are inspirational, and this year’s lineup is a soapmaker’s dream. A few years ago, I had to cancel a conference trip at the last minute because of family issues, forfeiting my tuition. I would love to recoup the loss and continue to move forward in the craft I love, learning from the masters. I’ve been a soaper for a long time and remember when the Guild first started. Then I moved to New Mexico. Since, I have had so much failure in my soap making that I’ve put it on the back burner. How I would love to go to the conference and talk with others to find out what I’m doing wrong and be able to regain my passion for something I loved to do. I’m not disabled and don’t work, boy, I really would like to have that flame relit! Reading previous comments I know it will a difficult decision to pick the lucky winner as there are so many deserving people. I don’t envy your position! I have been soaping for 1.5 years now and absolutely love it! I am a software engineer by day, and make soap when I can on the weekends. I love the art and especially the “science” of it. What started as a hobby led to an Etsy shop :-). When I’m not busy with family, I ride my horse and I volunteer in my community. Volunteering gives me a lot of satisfaction knowing that I am helping those that are less fortunate. I also donate my soap to a local battered woman’s shelter as a way of giving back. It would be a fabulous opportunity to attend this conference for the knowledge sharing and networking. I would like to understand more about making this into a more formal business and help other women that are thinking of starting their own businesses. The speaker lineup is impressive and I would love to hear what they have to say. I’ve learned so much from Anne-Marie, you are my hero. I only wish that I would have had the chance to meet you while there! I hope to see you at a future event. Thank you for offering this chance to everyone! You’re so right…it’s going to be a tough choice! I love that you have found a artistic outlet, and I totally agree, this conference would be a great opportunity to network and learn. Thanks for applying! This is just what I need to push my business to the next level! I would love to attend! Going to this conference would be a chance of a lifetime for me. The opportunity to learn everything from techniques to packaging and marketing from people who have already lived it would be a remarkable experience, one that I would be truly grateful for. I would love to attend the conference to expand my current knowledge in soap making. I consider soaping as an artisan skill. My great grandmother made lye soap in a black kettle in the yard on her farm. This is where my want to know and learn came from. I currently use just one recipe that I honed to make a nice soap, learning new techniques would be a plus! That’s so neat that your grandma used to make soap as well :). Thanks for applying! As someone who is just starting a new soap business, the chance to attend the soaper’s guild conference would be invaluable. I’m sure there will be a ton of qualified, deserving folks vying for a chance to go, but I want to throw my hat in the ring. In the roughly nine months I’ve been making soap, I’ve become an addict – every night I’m either formulating new recipes, researching methods, scents & ingredients, building my social network, working on packaging & presentation or pouring another batch of amazingly scented soap. It amazes me how different, how much better hand crafted soap looks, smells & feels. We are now officially 6 weeks away from launch, and I have big dreams… big burly dreams for our little company. Attending this conference would be an incredible opportunity to get us started on the right path. Thanks so much Anne-Marie! I would love to be in a room filled with the energy and spirit of soap makers and crafters and learn new knowledge from the speakers to boot. You not being there would be a bit of a damper though. Oh, I would SO LOVE to attend this workshop!! I am gearing up to start selling soap in the near future, trying to absorb and learn all I possibly can from the pros and those more experienced, and of course this was just not in our budget this year (hoping maybe next year I’ll be making enough money to buy my ticket!). Of course it won’t be quite as wonderful without you, Anne-Marie, but I know it would still be a fabulous and fun learning experience! Thanks for the chance – sorry you can’t go – I’d be bummed too! FYI – they still have you listed as a speaker. I would love to attend the conference but could not afford the ticket price plus travel and hotel expenses combined. I started my own healthy bath and body product company after my mom was diagnosed and died from cancer. Her illness made me look at all the harmful chemicals that are in bath and body products sold everywhere. I hope in some small way I can help my customers make better choices about what they put on their bodies as it is as important as what goes in. I love making soap and have learned a lot from the Soap Queen. I’m not surprised she is doing such an awesome thing by giving away a ticket. Thanks for the chance to win Anne-Marie. Even though I have been soaping for quite a few years now, I find I am always learning something new. I would absolutely love the opportunity to learn even more through the awesome speakers that are lined up for this conference. I keep thinking that it will come my way (Florida) someday soon! I REALLY want to learn how to make my business sustainable! I just know that this would be the opportunity of a lifetime to help me get there. I know whoever gets blessed with this gift will be very happy indeed! That’s one of the great things about soaping, there is always something new to learn! Thanks so much for entering, we will be announcing the winner soon! I would love to go, to learn new techniques, meet fellow soapers, and get new ideas for my business! Plus, it would be a wonderful graduation present, as my law school graduation is the weekend before! YOU Anne-Marie and your wonderful staff have addicted me for life. I can’t wait to retire so I can craft soap full time. I have so many ideas from your effective publishing techniques, I often have trouble deciding which project I want to accomplish next. You not only share inspiration for crafting soap, but also ideas for healthy food and family fun. Your management philosophy is spot on, where today’s work culture needs to be. WOW, I want to be more like you! My career has brought me to many conferences in my current profession of geographic information systems, I have organized conferences and spoken at them, I know how a conference can inspire, energize and take you to the next level. I’m ready! This would be an amazing chance to network with other soapers. This isn’t something that isn’t available to a lot of people. My mother taught me how to make soap and now I am a new mother. I have been making and selling soap word of mouth the past 2 years. I really want to take my soap business to the next level so I can be a work from home mother! I live in California so I can just drive right over to the conference! I would be proud to go toe to toe with any of the giant bath & body businesses. I love to educate my customers about what is the best ingredients for their skin. I would love an opportunity to go to the conference and learn new skills that I can apply in my business. This would be a dream come true for me! I am a fairly new soaper (a little over 2 years experience)and formed my LLC this year for Lion and Rose. I also joined the Handcrafted Soap Maker’s Guild for the first time this year. This conference would provide me invaluable information in helping me to grow my young business. Plus, since I am pregnant, you would get two for the price of one in my attendance! Also, my lovely husband says that we will make it work if I win, so I can’t pass up the chance to try! I would be proud to take Anne Marie’s place, but hope to see her speak some day. I am fairly new to soap making so I would love the opportunity to attend and have the chance to learn more about my craft. I think this would be a great opportunity to learn valuable info from all the speakers that could be put to use for my business as well as help me on where to go ffrom here. My product line doesnt contain soap mainly because im afraid of lye and getting ratios wrong. Im a very visual and hands on person so to be able to ask questions while see it being done would possibly eliminate that fear and expand my business more. Oh, I so wish I could go! I would love to learn new techniques and hear what other people in the business are talking about. Unfortunately, my husband has a conference that week in Vegas, so I’m staying home with the dog. I’ve the pleasure to know Lori, Joan and Ruth, Bay Area superstars in the industry – having attended classes at The Nova Studio. Here’s a chance to expand past my California borders. I’d like to gain more knowledge and industry insight from others who are just as passionate. In 2011 I closed my business for a year to live in Senegal. It was a profound and magical year for me and my family. I was once asked if the experience had influenced the design of my soaps. And actually it was the shea butter sold in the markets that intrigued me more upon my return. I’ve envisioned adding a new product line that connects me back to West Africa but I haven’t taken the step. I’m touched by the topic that Funlayo Albai will be speaking about. I want to hear her “meaningful connection” story and make one of my own! Thanks so much for sharing this with us, that’s so great that your experience has shaped your soapmaking! Oh, what a great opportunity! I am a new soap maker, I only began this past fall. I have purchased handmade soap for years. At any craft fair or festival, I would be the lady at the soap booth, drooling over the goodies. I started leaning into making my own cleaning products for financial reasons, and that in turn led to learning how to make my own soap. I have fallen in love 🙂 I had no idea it would be so much fun, or make me feel like I really accomplished something. I would love a chance to meet other soap makers, and learn some great skills at the same time! That’s so exciting that you have started soaping! I’m so glad you are enjoying it 🙂 Thanks so much for applying! I would love to go so I could meet and engage with other soap makers (and cosmetic formulators) who are as passionate and dedicated as I am to our art and business. There’s such a wealth of talent, leadership and moxy and it’s so much easier learning, growing and sharing when that talent is right there in the same room with you. As a new soaper, I would love the opportunity to learn from the best. As a 5th grade teacher I’d like the opportunity to escape from the madness of the last days of school! Thank you for the opportunity. You are the best! Arizona is a 15 hour drive for me so this would be doable! I am starting over once again at 55. I lost my husband to cancer 5 years ago. And now my two sons are about to leave the nest. I have held on to them tightly for fear of being alone. It is my fear that i will get bogged down wasting time wishing for what I had. I will be on my own for the first time in my life. I have been working to turn this business into a living. This conference is just what I need to get started on my journey into the future. I’m still very new to soaping and live in beautiful Tucson, but was not able to afford a ticket to the conference. I would love the opportunity to attend and learn from all the amazing talented soapers presenting and attending. I’m hoping to start a small soap business in the coming year and this would be a fabulous chance to get off to a great start! Thank you for consideration and best of luck to everyone! I would love to win this. What a wonderful opportunity to meet the faces of the industry and learn from those with experience. i would love to go .. i think it would be a great opportunity to meet new people and learn new techniques ! I agree, being able to attend this conference would be so fun and educational!